A Brand establishes the identity of your organization. It is the emotional and psychological relationship your firm has with its clients, community, internal and external stakeholders. A firm’s brand is the culmination of the organization’s people, quality, facilities, services, communications, as well as the mental and emotional interpretation of all experiences, both internal and external. 64% of people cite values as the main reason they connect to a brand. 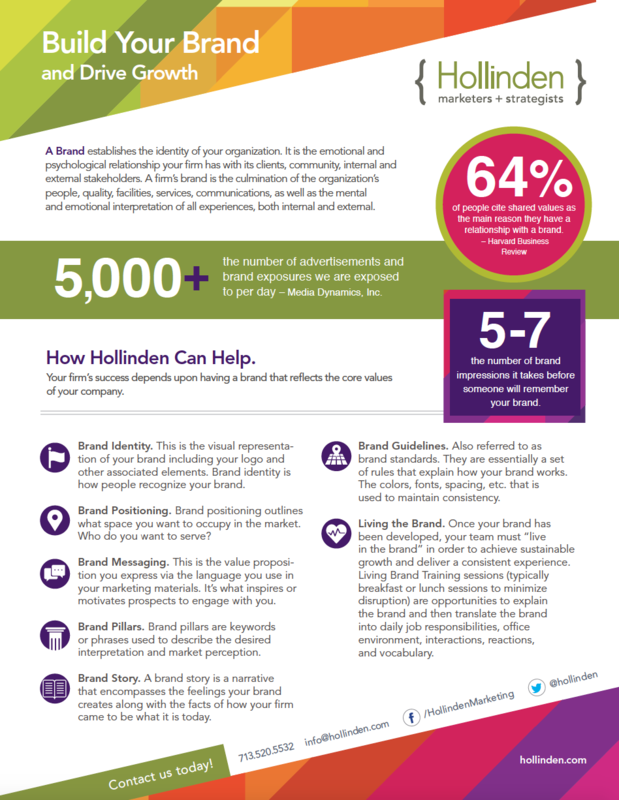 It usually takes 5-7 brand impressions before someone can remember your brand. And, the competition is fierce. We are currently exposed to around 5000 ads per day. BRAND IDENTITY. This is the visual representation of your brand including your logo and other associated elements. Brand identity is how people recognize your brand. BRAND POSITIONING. Brand positioning outlines what space you want to occupy in the market. Who do you want to serve? BRAND MESSAGING. This is the value proposition you express via the language you use in your marketing materials. It’s what inspires or motivates prospects to engage with you. BRAND PILLARS. Brand pillars are keywords or phrases used to describe the desired interpretation and market perception. BRAND STORY. A brand story is a narrative that encompasses the feelings your brand creates along with the facts of how your firm came to be what it is today. BRAND GUIDELINES. Also referred to as brand standards. They are essentially a set of rules that explain how your brand works. The colors, fonts, spacing, etc. that is used to maintain consistency. LIVING THE BRAND. Once your brand has been developed, your team must “live in the brand” in order to achieve sustainable growth and deliver a consistent experience. Living Brand Training sessions (typically breakfast or lunch sessions to minimize disruption) are opportunities to explain the brand and then translate the brand into daily job responsibilities, office environment, interactions, reactions, and vocabulary.